At what point does a terrible tattoo become a deal-breaker? Something racist or misogynist, sure, but what about just the truly juvenile and cringe-worthy? (I ask because I once saw a man at a music festival—his name was Chad—with “Chadillac” tattooed in the Cadillac script across his entire stomach.) If someone had, say, a roast beef and cheddar sandwich on their bicep, though, would that be awesome or awful? Now is your chance to find out. 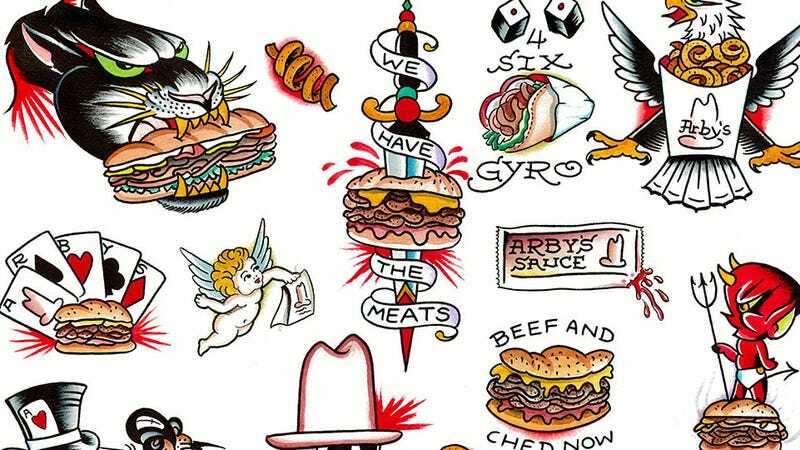 Arby’s, in what looks like an attempt to piggyback on the success of Domino’s free-pizza-for-life-if-you-get-a-Domino’s-tattoo promotion, is now offering free, permanent, Arby’s-themed tattoos. They’re calling it a “sandwiches for life” promotion, except you don’t get any sandwiches. You just get an Arby’s tattoo. For life. Per a press release, the one-day-only promotion takes place September 22 at Port City Tattoo in Long Beach, California, at which point Miguel “Uzi” Montgomery will tattoo fans with Arby’s designs for free. Yes, we are aware that this is entirely a publicity campaign to get us to write about Arby’s—so, well played, Arby’s. But we also have to think that someone out there might actually take them up on this and end up with a “We Have The Meats” lower-back tattoo. God bless them.